New, comfortable cottage "this property", built in 2014 from the 21st century, surrounded by fields. House Equipment: wood firing, solarium, washing machine (private use). Access & Parking: parking by the house. All-season motor access to the house. Steep street. Situation: on the outskirts of Ubrique, above Ubriuqe, secluded, quiet position in the countryside. View from the apartment of the mountains. 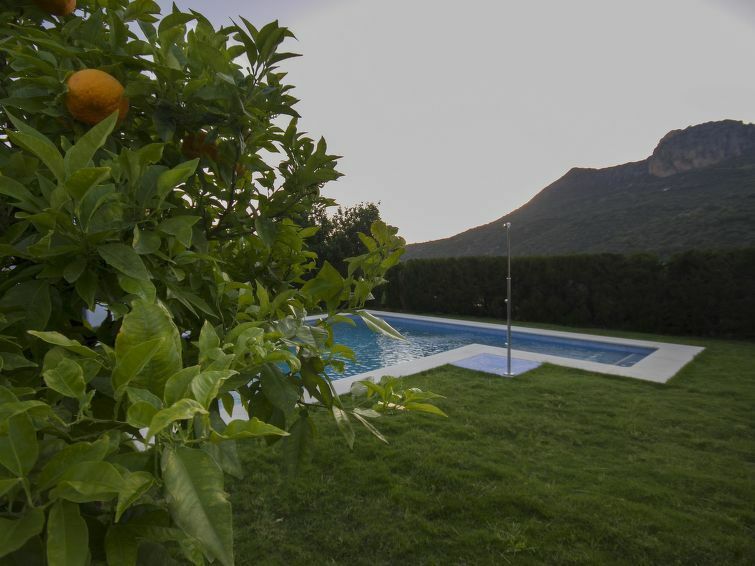 Surroundings of the house: grounds (private use, 9'000 m2, fenced), swimming pool (private use, length 8 m x width 5 m, open from 01.06. untill 15 .09. ), barbecue (private use). Facilities and distances: shop 4 km, grocers 4 km, supermarket 4 km, restaurant 4 km, indoor swimming pool 4 km, swimming pool 4 km, sports centre 4 km, golf course 42 km, tennis 4 km, children's playground 4 km, m bus stop 4 km. Please note, nearby is a motorway in 42 km, main road in 4 km, railway line in 85 km and ein airport/airfield in 85 km. 6-room house, detached, for 10 people, 250 m2 on 2 levels, comfortable and rustic furnishings. Living/dining room with local TV and open fireplace. Smoking not allowed. Internet (Wireless LAN [WLAN]). Sleeping room with 1 double bed. Sleeping room with 1 double bed. Sleeping room with 1 double bed. Sleeping room with 2 single beds. Sleeping room with 2 single beds. Kitchen with 4 hot plates, micro wave, dining table, dishwasher and fridge. Terrace 200 m2, patio 200 m2, terrace furniture, 4 deck chairs. Other equipment: iron, washing machine.